Hippotherapy is the use of horses for therapy. It's used to help children with autism spectrum disorder, adults suffering from physical or mental illnesses, and people who have suffered traumatic brain injuries. No single breed breed of horse is required for hippotherapy; but horses who serve in therapeutic treatment share some specific characteristics. Hippotherapy horses share certain characteristics. 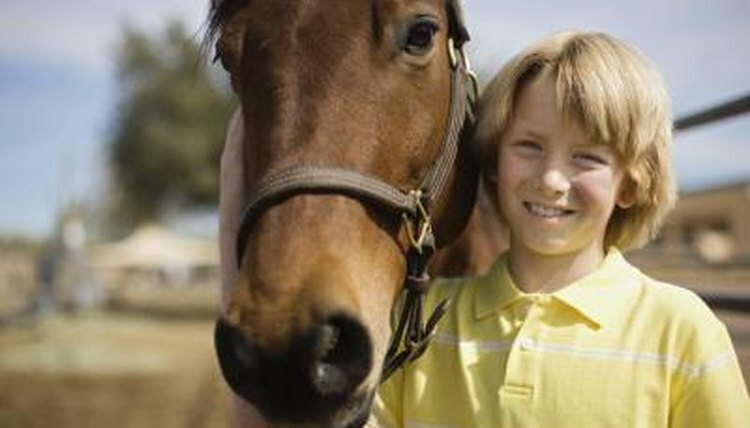 Geldings are most often used for hippopatherapy, followed by mares. Stallions are rarely used. Hippotherapy horses must be calm, gentle and even-tempered. Therapists look for horses who have good walking gaits, since many hippotherapy exercises are performed at the walk. They also look for horses with symmetrical motion to exercise patients' muscles evenly during sessions. Among the most frequently used horses for hippotherapy and therapeutic riding centers are American quarter horses. Quarter horses have the ideal temperament for working in therapeutic riding programs. They are calm, even-tempered and friendly. Appaloosa and paint horses also make good therapy horses for similar reasons. Ponies serve children's programs. Haflinger ponies are common in therapeutic riding programs. These calm ponies have strong, broad backs and are suitable for children or smaller adults. Polish Koniks, pony-size animals resembling extinct wild Tarpan horses, serve in Europe for hippotherapy. Draft horses are often used in hippotherapy programs for adults. Both pure and part-bred draft horses are used. Draft horses, like stock horses, have calm, docile temperaments. Certain breeds, such as the Belgian and Percheron, tend to be people-friendly and are well-suited for the daily interaction with adults and children with disabilities.